As with many of our customers, they are so pleased with the quality and craftsmanship of their building, they ask us to build them another one years later on. Not so with one particular Rochester Washington couple. They asked barn builders to construct another horse arena pole building right away. 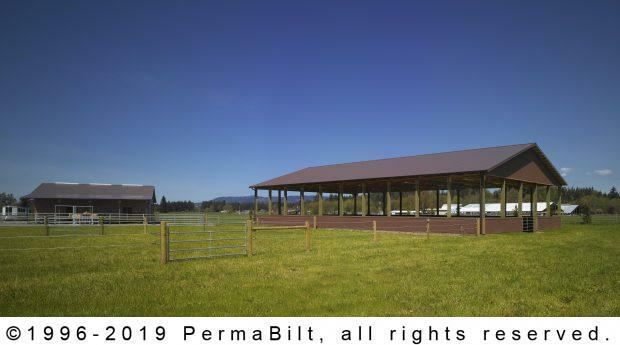 In this case, a pole horse arena building to match their horse barn that had just been erected. As we all know, the Northwest during the fall and winter months can be overwhelming with rain. Of course, riding a horse in the rain and muck and squalor is not good for man nor beast. And that’s why our barn builder team was tasked of building them a horse arena building. And like their horse barn, the most important aspect of building their horse arena was the safety and prosperity of their animals. 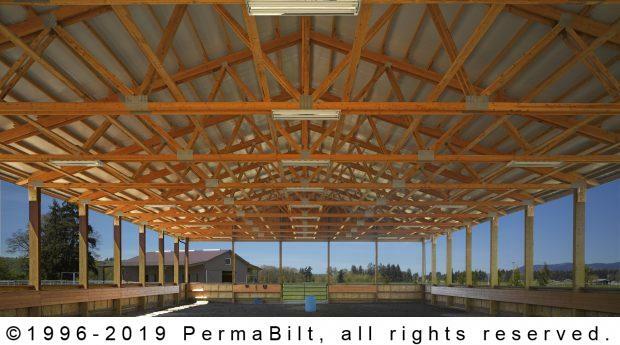 Our PermaBilt® Building Representative went through the building design process going over the smallest detail such as building orientation relative to the weather across sun, wind, rain and snow. Also, our Rochester couple wanted to be able to look outside their window and be able to see their horse barn and horse arena at the right angle. So we worked in those details into the site horse arena pole building design. It was these details that we attended to that gave our customers the confidence they needed to have us erect not just one pole building but two. And not just any building, but buildings that housed part of their family. Knowing that they were surrounded by quality gave our customers the peace of mind they needed. Our highly trained barn builders will always provide personal service at your building site to ensure that every step of the construction process is smooth and worry free. Our barn builders assist with siting and permitting through construction and cleanup, as well as financing and warranty. We are an established local pole barn building company you can depend on to build your post frame structure right the first time, and to last. "Everyone at your company with whom I dealt with gave me excellent service and delivered a product that meets all my needs and more. Thank you for the excellent work."